So this step function is equal to 0 when time t is negative and is equal to 1 when time t is 0 or positive. Alternatively, you can say there’s a jump in the function value at time t = 0. Math gurus call this jump a discontinuity. Although you can’t generate an ideal step function, you can approximate a step function. Here is what a step function looks like, along with a circuit that’s roughly a step function. 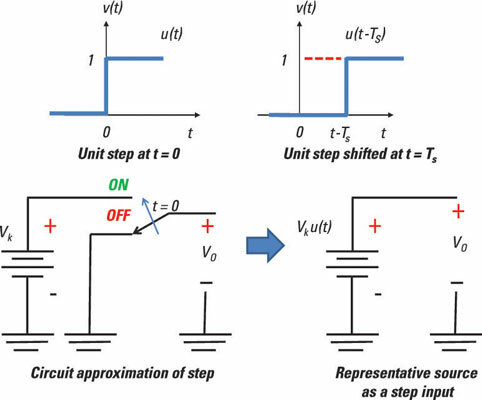 The circuit approximation of the step function shown earlier assumes you can quickly change from off to on at time t = 0 when the switch is thrown. The scale or weight of the unit input is Vk. The amplitude Vk measures the size of the jump in function value. This equation says the function equals 0 before time Ts and that the value of the function jumps to Vk after time Ts. Here you see the step function weighted by Vk with a time shift of Ts. You can add two step functions together to form a pulse function, as you learn in the next section. Step functions can dance around, but it’s not the fancy twist-and-shout kind of dancing. The function can become bigger or smaller and move to the left or right. You can add those modified step functions to make even more funky step functions. For example, you can generate a rectangular pulse as a sum of two step functions. Here is a visual of this concept, which shows a rectangular pulse that consists of the sum of two step functions in time. This expression says that you create a pulse with a time-shifted step function starting at 1 second with an amplitude of 3 and add it to another time-shifted step function starting at 2 seconds with an amplitude of –3. You can view the pulse as a gating function for electronic switches to allow or stop a signal from passing through. The ramp doesn’t start until TS. Before the time shift TS, the ramp function is 0. 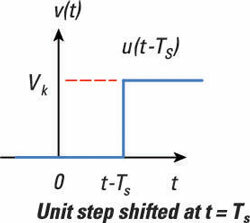 After time TS, the ramp has a value equal to Kr(t – TS). 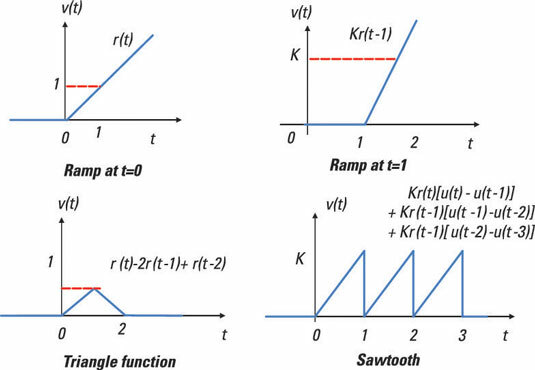 With ramp functions, you can create triangular and sawtooth functions (or waveforms). Here you see a ramp of unit strength, a ramp of strength K with a time shift of 1, a triangular waveform, and a sawtooth waveform. Building such waveforms from other functions is useful when you’re breaking the input into recognizable pieces and applying superposition. Turn on a ramp with a slope of 1 starting at time t = 0. Add a ramp that has a slope of –2 and starts at t = 1. At t = 1, you see the function start to decrease with a slope of –1. But before that, the slope of the function (from the first ramp) is 1; adding a ramp with a slope of –2 to the first ramp results in a ramp with a slope of –1. Turn off the second ramp by adding another delayed ramp that has a slope of 1 and starts at time t = 2. Adding a ramp with a slope of 1 brings the slope back to 0. Start with a ramp of slope (or strength) K multiplied by a rectangular pulse of unit height. Apply a time delay of 1 to the ramp pulse r1(t) to get another ramp pulse r2(t) that’s time shifted. Repeat Step 2 to get more delayed ramp pulses starting at 2, 3, 4, and so on. Add up all the functions to get the sawtooth st(t).